One of the most common backyard hawks, the sharp-shinned hawk is an agile predator that feeds on small birds such as finches and sparrows. Markings: Genders are similar. Head and back are medium to dark gray, white breast is thickly streaked with rusty red or brown streaks, long squared-off tail has darker gray horizontal strips and a thin white stripe on the tip. Adults have red eyes while juvenile birds have yellow eyes with a faint white streak along the eyebrow. Sharp-shinned hawks are common in woodland areas and open lowlands throughout the United States, southern and western Canada, Mexico and Central America. Northern bird populations will migrate to the South, but sharp-shinned hawks in the western mountains of Utah, Wyoming, Colorado, Montana, southern Idaho, northern California, Washington and Oregon may be present year-round. Hawks rely partially on stealth to capture their prey and sounds are rare. 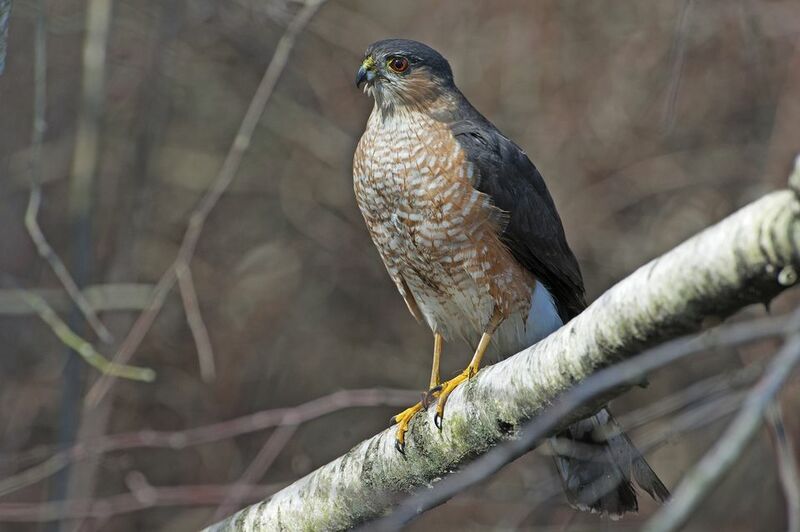 Sharp-shinned hawks will call a harsh “kee-kee-kee” or “kik-kik-kik” alarm when a nest is threatened. Like all birds of prey, sharp-shinned hawks will soar over their territory to locate prey. They are likely to feed on the ground after capturing a bird, mouse or other small mammal and may remain on the ground for several minutes after feeding. They will perch in areas with good visibility to locate feeding grounds, and often make short, close flights over bushes or dense brush to startle small birds into flight to be easier to catch. The sharp-shinned hawk’s long tail and rounded wings give them excellent maneuverability through dense brush and trees in pursuit of prey. Female sharp-shinned hawks build a platform nest and raise one brood of three to five altricial young per year. Eggs must be incubated for 30-35 days and fledgling birds remain in the nest for another 25-27 days. Both male and female birds will feed and rear the nestlings. Juvenile sharp-shinned hawks can be identified by their yellow eyes, more brownish color rather than red on the breast and their inexperience while hunting. Because sharp-shinned hawks feed on smaller birds, they are attracted to backyards where sparrows, doves and other small birds feed. If feeding areas are visible from the air, hawks are more likely to be frequent visitors. Many backyard birders prefer to take steps to protect backyard birds from hawks rather than allow them to feed easily.